Linda Buxton’s father has been treated and discharged from hospital twice, one without any help and one with the full support of the Care Home Selection service. She describes the difference it makes. “Dad is 97 and until last year, was still living independently in his own home in Salisbury, Wiltshire. He had a fall and went into hospital. What happened after he was discharged was our first experience of how things can be done well or very badly. Dad was supposed to go back home with a package of social care but this wasn’t organised properly and I wasn’t told. I had a phone call from Dad after he was left alone at home in a cold house – he had called me to say he didn’t know what to do. Within days, Dad was back in hospital with an infection. It was clear that he was no longer managing on his own and would need to go into a care home. I asked for help but all I was given was a handbook of care homes in Hampshire, as we wanted Dad to move to somewhere near or in Southampton, to be close to where I live. I used the handbook and looked at websites online, but there is critical information that they don’t tell you. Dad is self-funding and so it was vital to know fees for each care home and whether it would be within our budget. I found a website that theoretically tells you what homes have vacancies, but that was often weeks out of date. This meant a lot of time was wasted looking at and phoning care homes that weren’t appropriate or affordable for Dad, or homes that simply didn’t have vacancies. Dad had gone into hospital in May and by June, we received a strongly worded letter from the hospital, stating it was not appropriate for him to stay there any longer and describing the pressure on hospital beds. I certainly understood their point of view, but it made a stressful situation even harder. This was something I had no experience of and I felt very alone facing a difficult and important choice. In the end, it was a chance conversation with a friend that led me to the care home we eventually chose. Her mother had been happy there and it seemed a good choice for Dad. Without any professional help, it took about a month from the point when Dad was fit for discharge to him moving into the home. Eighteen months later, Dad had another fall and went into Southampton General Hospital. We were advised that he couldn’t move back into the home where he had been living, so once again, we needed to find a care home and it was only a few days before Christmas. But this time, the experience could not have been more different. On December 22, a person from social services called to explain that we would receive help from the Care Home Selection service. The next day, Melissa from Care Home Selection called me. She had already done some research for us and gave me the names of three homes, having found out exactly what the fees would be, what floor the rooms being offered were on and the numbers to call. This meant that I was able to visit three homes the following day, which was Christmas Eve. Melissa advised me on key points to raise, such as asking when would they be able to come to hospital and assess my father. With the background work from Care Home Selection, we quickly narrowed it down to six care homes. I visited all of them – they were all good choices and every one would have been acceptable. 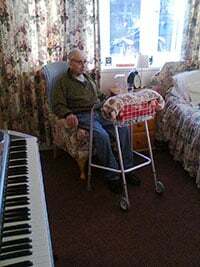 The one I selected for Dad had all the things we wanted in terms of facilities for him: his room is downstairs, large and airy, with an en-suite and importantly, the residents looked well cared for and stimulated. It seemed a place where Dad would fit in and he has settled very well. He still enjoys playing the keyboard and has an appreciative audience. Even though we had the Christmas break when we couldn’t visit care homes, it only took two weeks for Dad to move into his new home, less than half the time it had taken in Salisbury. There is huge reassurance when you have the backing of a service like Care Home Selection. They work closely with social services, so I knew that if there were any safeguarding concerns about a home, they would flag them up with me. It was reassuring for my siblings who live in different locations and couldn’t be involved in the search – it wasn’t just me making the choice; I had the backing of a specialist service.